Vicki and I have been working on this for over a month as the replacement for the 2008 Horizon Project. Here's the announcement. Lots of opportunities for educators to participate. Check our wiki for up to date information and how YOU can join in with your classroom or as an volunteer educator. As announced at the Flat Classroom conference this past Monday, the Net Generation Education Project is the replacement for the Horizon Project and will include approximately 10 schools with 300 students. The application process is now open for schools who wish to participate in the project. Last year, Don Tapscott keynoted the Horizon Project 2008 which focused on having students envision the future of education via web collaboration and video. The reading documents include the Horizon Report 2009 from the New Media Consortium and Educause. Don Tapscott went on to include this project in his new Book, Grown Up Digital: How the Net Generation is Changing Your World . So, the next level of "flattening" is to not only have classrooms connect but to have the classrooms connect in new and more far-reaching ways with the authors of their books. Recent examples of connected classrooms and authors include Karl Fisch's Whole New Mind Project as they work with Dan Pink and such as Will Richardson and Anne Davis did with Sue Monk Kidd, author of the Secret Life of Bees. In the same genre students in this project will interact on a Ning jointly created with Don Tapscott. Don will post weekly questions to the Discussion forum and leave video messages to the students. It will be a read/write project. He will also interact LIVE via a webinar. Don has a vision for improved educational outcomes and is reaching out to interact directly with students through his challenge and this project. Additionally, the Discovery Educator Network is going to be providing and sharing tips and information on effective video presentations and how-to's and a book club group for educators. Don Tapscott will keynote and the student keynotes are award winning virtual worlds educator Peggy Sheehy and her middle School students from Suffern Middle School using machinima from their Island in Second Life. We will be studying this year's Horizon Report (released January 2009) but adding to it the intro and Chapter 5 from Don's book, Grown Up Digital: (Rethinking Education) to the reading assignments for students. Students will be divided into groups to analyze some of the key trends in reworking education to create collaborative report written with other students from around the world. Each team will have a project manager and assistant project manager to help facilitate the work on the team. These "managers" will be students with teachers working as facilitators. Each student will cast their vision for the future of education with a video to be uploaded on our project ning. All videos will be automatically entered into Don Tapscott's Net Generation Education Challenge competition and could win scholarship money for future educational pursuits. You do not HAVE to be a part of the project with Vicki and I to join the Ning and participate in Don's challenge competition - so go ahead and do that. But if you are ready to have your students collaborate globally and follow the best practices as used in the award winning Flat Classroom, Horizon, and Digiteen projects fill out this form before February 9th and applynow!. 2/11 - Greeting from Don posted to the Ning via video - this may be his "author keynote" or he may choose to have a challenge each week and have it be small pieces. Weekly- discussions posted to the forum (can we pick a day and a time for this to happen?) Will Don have a blog on the site as well? A crisis is emerging in our schools and universities. Traditional, one-way broadcast models of education are out-dated. Schools have not evolved as quickly as other institutions, and students are becoming disengaged as a result. Why are connected students at home suddenly disconnected at school? How can we reinvent education for relevance and effectiveness for the 21st century? Inspired by the work of Don Tapscott and Grown Up Digital, the Net Gen Education Challenge offers everyone an outlet through which to express their ideas and opinions about their ideal model of education. The challenge community will connect engaged participants all around the world, bringing educators, students, parents and professionals together in a global dialogue on learning. In partnership with the CBC, Flat Classroom Project, the Discovery Channel's Educator Network and Classroom 2.0, Don Tapscott invites you to share your ideas and help make education engaging, inspiring and relevant. 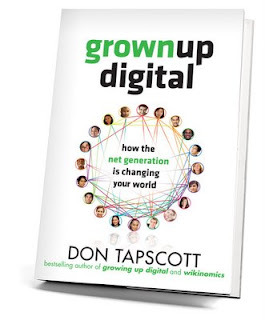 In conjunction with the Net Generation Education (NGE) project, the Discovery Educator Network (DEN) will be hosting a weekly book club for Tapscott's work, Grown Up Digital: How the Net Generation is Changing Your World. While the NGE project will be focusing just on the Intro and Chapter 5, we will gather together weekly to discuss the ideas within the book and their implications for education. Best of all, the author himself, Don Tapscott, will sit in on the final week to share his thoughts in a candid conversation with everyone who participates in the book club. There will be both live and web based discussion options for participants. The live component will take place Monday evenings, 2/9 through 3/23 at 7pm EST. We will be looking for people to lead the weekly discussions as well. If you would be interested in volunteering to lead the discussion for one of the weekly meetings, please mark it on the registration form. If you are a DEN member and would like to be a part of the book club, please register here. If you are not currently a DEN member and would like to learn more, please contact me ! Don's publisher has been gracious enough to offer the book for only $18.45, a generous discount, to everybody who participates in the Book Club. Call Aaron at 1.414.274.6406, ext. 204 and do the same. To support teachers and students who are participating in the Net Generation Education Project, the Discovery Educator Network will be hosting four webinars with two of the country's foremost experts on digital storytelling; Hall Davidson and Joe Brennan. These webinars will be intended for teachers to attend WITH their students so that they may learn ways to create digital stories from the very best. To learn more about Hall Davidson and Joe Brennan, visit the Discovery Education Speakers Bureau. Hope, these projects will be a guiding for learners.